I love making simple and healthy sandwiches for my breakfast. I prepare these for kids lunch boxes and serve the same for our breakfast. It's like 2 birds for one shot. While these are done at the same time, my morning routine becomes so much manageable. When I am having this Red Pepper and Mushroom Smothered Cheese sandwich for breakfast in an early morning meeting at work ( this is so manageable as a to-go sandwich too! ), one of my colleague demanded for recipe. That's when I sit down to write this simple sandwich recipe, I have covered both Veggie and Vegan versions here. Here is the recipe, Njoy! Remove the Stem from Mushroom bottom and chop into small pieces. Toast Bread Slices on the pan. Heat non-stick pan and add oil to it. Once the oil is hot, add red pepper and mushroom pieces to the pan, sauté them for 2 min. Add salt, black pepper and PavBaji masala to veggies ( leave some salt & black pepper for Avocado spread). Mix spices with veggies and switch of the stove, take the pan out from the heat. Heat the Non-stick pan and arrange two bread slices. Layer cheese on one side of the bread. Top with half of Pepper and Mushroom sauté on cheese. Add another cheese layer on top of veggie mix. Now top with another toasted bread slices. Press down with spatula for the sandwich to stick together. toast in on both sides for 30 sec. Take it out from the Pan and cut in half and serve! Yummy! Take Half of Avocado, spoon it out from it's shell and add to mortar. add remaining salt and black pepper. add lime juice. With pastel roughly smash avocado in the mortar until it becomes like Avocado paste. Take one slice of Toasted Bread and spread with Avocado Spread. Add remaining pepper and mushroom veggie mix on top of avocado. Add remaining Avocado spread on top of veggie mix. Top with another slice of toasted bread and, press down on both sides. Cut into half and dive into this delicious freshly made healthy sandwich. 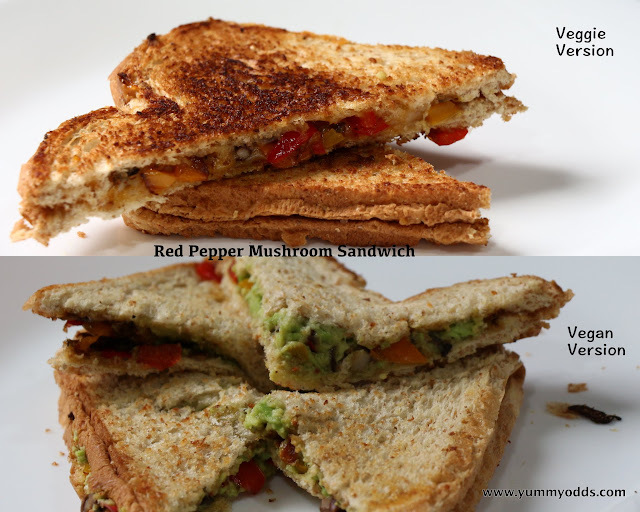 Hope you liked these simple and healthy sandwiches!